Laser eye surgery has come a long way since it was first introduced in the UK in 1990. These days, laser eye surgery makes up around 75% of all surgical procedures carried out in the UK. The technology behind laser eye surgery is constantly being developed and improved to make it even better, safer and more affordable. Given the sheer number of laser eye surgery providers in the country today, the question of which surgeon and clinic to go to can be really daunting but doing your research is really essential to making the right choice. The guide below will hopefully help you determine if laser eye surgery is right for you and which are the best clinics if you decide to take the plunge and part with your hard earned cash. Will Laser Eye Surgery Work For Me? Presbyopia occurs naturally during the ageing process, presbyopia is a type of farsightedness. It’s caused as the lens hardens and loses some of its elasticity, meaning it cannot focus the light on the retina correctly when looking at close-up objects. Astigmatism is another common but minor eye condition, astigmatism causes distorted or blurred vision. It arises when the lens or cornea is an irregular shaped (i.e. less like a football and more like a rugby ball). The majority of glasses wearers will have a certain degree of astigmatism. Hyperopia (also known as long sightedness), is the opposite to myopia whereby people can see objects in the distance clearly but will often find that items in the near distance are blurry and fuzzy. Myopia (also known as short sightedness), whereby you are able to see nearby objects to a higher level of clarity, but distant objects appear blurred. Before going under the excimer laser, your optometrist will discuss the best treatments available for your particular prescription. If you suffer from astigmatism, LASIK is a very effective treatment but if you have thin corneas, or have some scarring on your cornea, you will not be eligible for LASIK and LASEK will be a better option. It will also be worth your time to look into the more effective Wavefront variations of both LASIK and LASEK which is a customised treatment that accurately maps the contours of the eye and can help people with severe astigmatism. You’re within the prescription limits set by the clinic (this tends to fall within -10.00D to +4.00D, and up to +/- 6.00D of astigmatism). What Is The Best Laser Eye Surgery Clinic Near Me? Now it’s time to consider the clinics and the all-important prices. We would recommend using our comparison form to get current prices from reputable clinics in your area. To compare local clinic prices enter your postcode in the form on this page.  If you compare laser eye surgery prices published on the clinic’s own website make sure you check if the advertised prices are fixed for all patients or dependent on prescriptions. If the price starts with ‘From’, it is a teaser rate and likely will only to be available to a small percentage of patients with low prescriptions. Also, make sure you are comparing like for like in terms of the treatments offered (different clinics will use different names for the same treatment). Read impartial reviews from people who have had the same laser eye treatment in the clinic you are considering using. It’s best to use independent review sites like Trustpilot rather than read testimonials and celebrity endorsements on the clinic’s own website, as these will have been selected to present the best possible impression. 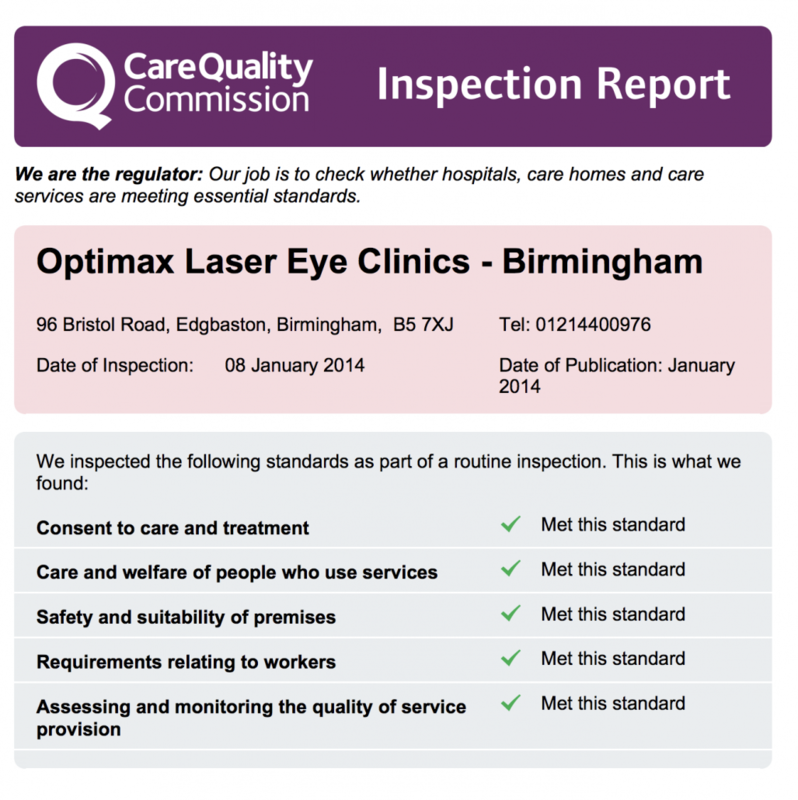 The inspection reports published on the Quality Care Commission site are also very good and worth reading – they go into depth about their findings and publish inspection reports for individual laser eye surgery clinics around the UK. Do take care to consider factors that will have affected the previous patients’ reviews and don’t be put off straight away if you find a small number of negative reviews. Some patients give negative reviews because they experienced complications that may not have been avoidable no matter what clinic they used. Surgery results will depend not just on how good the surgeon is, but also on the patient’s sight problem and prescription, as well as the type of procedure used. PRK (photorefractive keratectomy): This form of eye correction was widely used since the early 1980s, but since the introduction of LASIK and LASEK, it’s now widely used in the correction of low prescriptions. Reshaping of the cornea is done without eliminating a flap of tissue using the excimer laser. LASIK (laser in situ keratomileusis): This is the most common form of laser eye surgery procedure. LASIK is used to correct both short and long-sightedness. However, for people who require higher prescriptions it may not be the best form of treatment. LASIK is done by the surgeon cutting across the cornea and subsequently raising a flap of tissue. 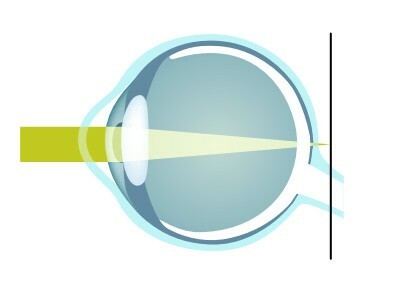 The excimer laser is then used to reshape the exposed surface and the flap is replaced (see illustration below). LASEK (laser epithelial keratomileusis): This form of treatment is closely related to PRK, with the only difference being that the surface layer (epithelium) of the cornea is not removed, but rather retained as a flap. Retaining the flap is considered to prevent any complications while at the same time speeding up healing. Wavefront-Guided LASIK and LASEK: Rather than a one size fits all treatment, this is is a tailor-made form of laser eye surgery where treatment is customised to a patient’s particular eye shape and prescription through the use of computerised 3D imaging technology. ReLEx SMILE (Small Incision Lenticule Extraction): This is a new, minimally-invasive laser eye treatment which offers a great offering a great alternative to LASEK and LASIK treatment. Rather than creating a flap in the cornea for the laser, this procedure involves making a small hole in the cornea using a state of the art laser that places a series of pulses in the centre of the cornea. which will heal on its own afterwards.  Although it is more expensive than the other techniques, very good results have been achieved using this method. This technique allows surgeons to treat patients with even higher prescriptions than previously deemed possible. The procedure is even suitable for many patients with thinner corneas, drier eyes, or contact lens intolerance. Who Are The Best Laser Eye Surgeons? Dr Malcolm Samuel has been working at Optimax since 1999 and is a regular delegate and speaker at various Laser Eye Surgery Conferences and seminars. Ali Mearza runs his private practice in Harley Street (London) whilst also working as a consultant ophthalmic surgeon and Clinical Director of Ophthalmology Services at the Imperial College Healthcare NHS Trust in West London. Professor Dan Reinstein is well-known not just as a pioneering surgeon but also as an academic. He heads the team of surgeons at London Vision Clinic. Mr Allon Barsam is an internationally recognised consultant laser eye surgeon, practising in centres of excellence in London and Hertfordshire, with clinics in Harley Street, The Wellington Platinum, The Spire Harpenden and The Spire Bushey. Mr C T Pillai is the founder and medical director of Advance Vision Care who has done over 20,000 successful laser eye procedures to date. He is one of the most respected consultants in the UK. Mr Bruce Allan is a highly respected name in the field of laser eye surgery research. He provides laser eye surgery services at Moorfields Eye Hospital. Mr David Allamby is the founder and medical director of Focus in central London. He works as a full-time laser eye surgeon and was the first surgeon to perform laser blended vision surgery in the UK to treat presbyopia, a degenerative sight problem brought on by ageing. Have they had formal refractive surgery training? How long did they have this for? Unfortunately, some surgeons will learn ‘on the job’ and can take a one-day examination that gives them a basic qualification. Are they a qualified doctor who’s registered with the General Medical Council? (This is required to be a laser eye surgeon). Are they an expert in the procedure you’re about to have? You should always try to seek a surgeon who has plenty of experience within the specific laser eye surgery area you’re considering (e.g. SMILE, LASIK or LASEK). Are they a trained corneal specialist? How many procedures do they perform a week? Remember – quantity isn’t always quality and it’s best to check other factors too. Will this surgeon carry out your post-operative check? And will they do the consultations at all your follow-up appointments? There’s a lot to consider when you’re thinking about laser eye surgery, which is why it’s important to take your time and do thorough research. Once you have your list of promising providers, book a free consultation. This is your chance to find out about the clinic’s premises, staff, equipment and, of course, the surgeon who will be allocated to you. Be open with the consultant about any worries you might have about the procedure, your recovery and the results. What is your clinic’s success rate? What is its complication rate? What kind of aftercare will I receive? Is that incorporated in the price? What if my problem is over- or under-corrected? Will the clinic do a corrective surgery for free? Are you entitled to a refund if you change your mind after booking the surgery? How long will the results of your operation last for? Is it likely you’ll need more surgery in the future? Will you need to wear your glasses after the surgery? If so, what for? What potential complications could arise during or after the surgery? How have they corrected these in the past? What will you/won’t you be able to do after the surgery? Asking these questions will help give you clarity on the procedure and what will happen if something does go wrong. Finally, always make sure you’ve got the contact details of your surgeon or someone who can help you after your surgery if there is a problem. If you decide you want laser eye surgery in the UK you will then need to decide on whether you want to use a private clinic or an NHS supported facility if you are eligible. However, not everyone qualifies for laser eye surgery on the NHS. Under the NHS provisions, not all of these conditions (myopia, hyperopia, astigmatism and diabetic retinopathy) can be treated. The NHS only allows for treatment of eye conditions, which if left untreated, can result in loss of vision and even blindness. Therefore, only diabetic retinopathy is considered to result in loss of vision, while myopia, hyperopia and astigmatism can be successfully treated by other options such as wearing eye glasses or contact lenses. Therefore, laser eye surgery is rarely available on the NHS, although some NHS trusts operate laser eye surgery clinics that charge a fee. This makes private clinics the only option for anyone seeking to have laser eye surgery to correct refractive errors that are not covered by NHS. When you’re looking for permanent vision correction, you may find lens implants a more suitable solution. Evolving from cataract surgery, these state-of-the-art procedures include refractive lens exchange (RLE) and phakic intraocular lenses (PIOLs). In essence, PIOLs are like having permanent contact lenses placed in your eyes because the natural lens isn’t removed beforehand. It also eliminates many of the restrictions faced with contact lenses as this lens is inside your eye. This type of surgery is often recommended for younger patients who have a high degree of astigmatism, aren’t suitable for laser eye surgery or have a high eye prescription. In contrast, RLE is often better for older people who aren’t suitable for laser eye surgery, have a high eye prescription or are suffering from the start of cataracts. This procedure is the same as cataract surgery as the natural lens is removed before a monofocal or multifocal lens is put in its place. Sometimes, patients will choose to continue using contact lenses or glasses instead of undergoing surgery. You will just need to weigh up the pros (i.e. being relatively risk-free) and cons (i.e. the restrictions you face) of these to see which avenue is right for you. What Are the Possible Risks of Laser Eye Surgery? Glare, halos and double vision. Most common at night, these symptoms do tend to disappear within a few days. Dry eyes. For up to six months after your operation you may experience dry, gritty sensations in your eyes, which can affect the quality of your vision. Eye drops often help ease these symptoms, though. Undercorrection or overcorrection. Sometimes, not enough or too much tissue is removed which may mean you need further surgery. The latter is harder to rectify due to the amount of tissue that’s already been removed. 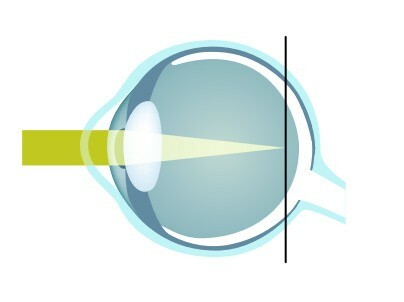 Astigmatism. This occurs when tissue is removed unevenly and glasses, contact lenses or more surgery may be required. Changes to or loss of vision. In extremely rare cases, vision loss can arise due to a complication in surgery. Some patients also find they can’t see as sharply or clearly as they did before the procedure. What Are the Possible Side Effects of Laser Surgery? Vision changes. These include starbursts, glare, ghost images and halos. These are more common if you had a high prescription but should disappear within a few months. Eye blurring and/or discomfort. As well as the dry sensation mentioned previously, some patients may find their eyes blur intermittently. Again, this should rectify itself within a few months. Infection. Although rare, you are at risk of infection post-surgery, particularly if you’ve had a surface ablation (e.g. PRK). Appearance. Red blotches can appear in the whites of your eyes and are caused by small blood leaks, but these aren’t harmful and don’t affect your eyes’ health. They should disappear within six weeks. To make sure you lower your risk of suffering from any of the aforementioned side effects or risks, there are a number of things you can do during or after your surgery. Firstly, it’s important to remain relaxed throughout your procedure, focusing on the light above your head so the surgeon can accurately use the laser. However, don’t worry if your eyes do move, as the lasers are designed to track these eye movements. You should also use the eye drops provided to you by your surgeon as these will help keep your eyes lubricated (avoiding dry eyes), while also preventing inflammation and infection. Follow your surgeon’s advice on what you can/can’t do for the weeks/months following your surgery, too. E.g. LASIK patients aren’t able to play contact sports for a month after their surgery. Finally, always attend your follow-up appointments to make sure your eyes are healing correctly, and contact your surgeon immediately if you have any concerns (e.g. blurring, increased pain, light sensitivity or an injury to your eye). What additional costs might you face? The surgery might be cheaper but don’t forget to allow for accommodation, flights and travelling to and from your follow-up appointments. Is the surgeon qualified? Unlike the UK which regulates surgeons, some foreign countries will not. So, always check your surgeon has the right qualifications before proceeding. And also check whether there are any healthcare regulations in place in the country you’re heading to. Will you meet the surgeon before your procedure? It’s important to talk to the surgeon before your operation so you can ask important questions and feel at ease with what they’re about to do. Does everyone speak English? To avoid any communication barriers, it’s crucial you make sure there’s an interpreter available if your surgeon doesn’t speak English. What are the surgeon’s and clinic’s reviews like? Just like when you’re getting surgery in the UK, it’s important to look at unbiased reviews to see if the clinic and surgeon are credible. What if you have problems post-surgery? Always check you’ll be able to visit a surgeon in the UK if you experience any unwanted side effects after your surgery. Sometimes, you may need to return to the country you had the operation in to receive this aftercare.